Item # 316518 Stash Points: 295 (?) This is the number of points you get in The Zumiez Stash for purchasing this item. Stash points are redeemable for exclusive rewards only available to Zumiez Stash members. To redeem your points check out the rewards catalog on thestash.zumiez.com. 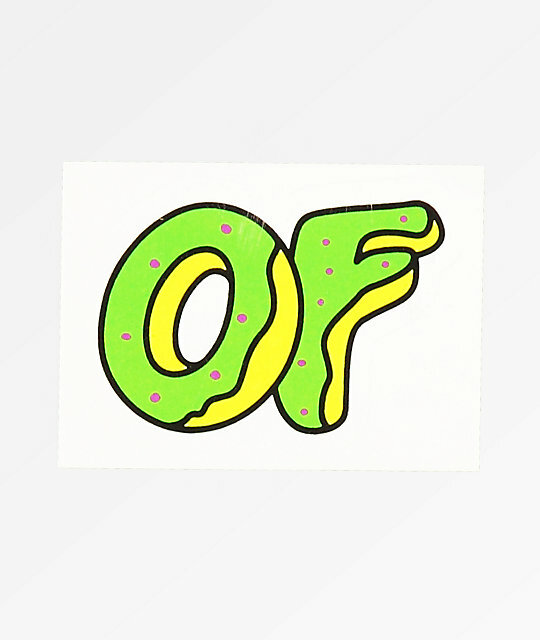 Give your sticker collection some delicious style with the Odd Future Green Donut Sticker. This durable vinyl constructed sticker features the classic "OF" logo in green donut style text for a classic and colorful look. Green Donut Sticker from Odd Future. OF Donut script logo at the center. 2.5" x 2" | 6.5cm x 5cm (approx. ).